Star Wars lounge pants. Mens Star Wars PJ's. Featuring Star Wars logo all over print with a fully elasticated waist and an adjustable tie. Made from a soft cotton mix with long legs make these the perfect choice for any Star Wars fan! 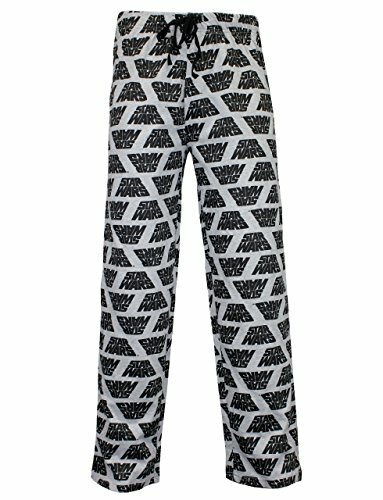 Mens Star Wars lounge pants with all over Star Wars print. Are you an Obi-Wan Kenobi or Luke Skywalker fan? Perhaps you prefer the Darkside and love Darth Vader? These pj bottoms are perfect for both! These awesome Star Wars lounge pants have long legs, fully elasticated waist for added comfort and drawstring tie. Perfect addition to any Star Wars fans wardrobe!